We’re well documented when it comes to our abiding affection for Kihachi, and indeed find it to be one of the crown jewels of our local immigrant kitchen restaurant scene. That said, given the cost of entry, we’ve been a bit apprehensive about including such a high-end restaurant among the roster of the usual bang-for-the-buck dynamos here at alt.eats. That’s not to say that Kihachi is a bad value. Given the uncompromising quality of the ingredients and the exceptional technical skills put to use in preparing them, it could even be considered a bargain. But, still, a conspicuously costly bargain. Or at least that’s the perception. In previous visits, we’ve been repeatedly seduced by the siren song of Chef Kimura’s more exotic offerings, and though we’ve felt entirely rewarded for doing so, the down side of that approach (aside from the overdraft fees) is that we’ve ignored some of the menu’s Japanese staple dishes, whose prices are often far less dear. So with that in mind, we set out to see both a) if it was possible for a couple to eat a full and satisfying meal for $25/person (tax & tip excluded), and b) if the food in that range was similar, in quality of execution, to the higher priced items. 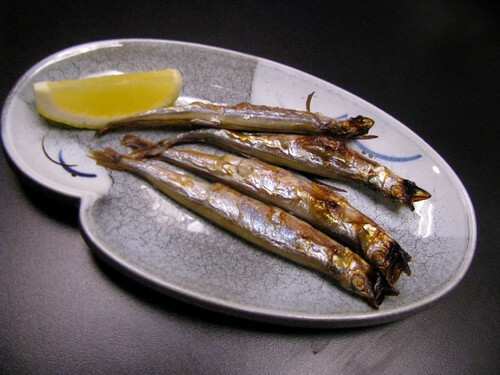 There are essentially three menus to choose from – dinner, small plates, and daily small plate specials (which are written in Japanese, affixed to the regular small plates menu, and translated by the server). Our usual approach has been to order a variety of small dishes from both of the small plates menus. This can get expensive if you intend to eat till full, so on this visit we ordered a dinner menu item each (most of which are less expensive than some of the small plates and larger in portions) and then augmented as our budget allowed. Simply put, this is the most compelling case I’ve seen made for why tofu can be delicious: four lightly battered cubes of fried tofu sit in a mix of dashi, soy, and mirin, and topped with seaweed, green onion, grated daikon and bonito flakes. The textures, flavors, and appearance all delight. 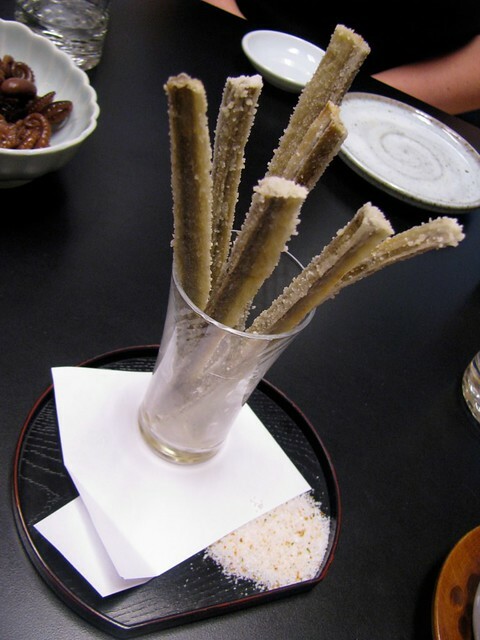 This is the root of the plant that leaves burrs on your clothes as you walk through the woods (burdock), sliced into thin sticks, lightly floured and fried, and presented with a side of seasoned salt. It’s as comforting as a french fry, but far more interesting with its potato-meets-artichoke flavor and slight snap to the bite. That’s right, four little whole fish (capelin are members of the smelt family), mouths agape in expressions of abject terror. They shouldn’t act so surprised – they had to realize that they’re richly flavorful bites of ocean-tinged goodness. 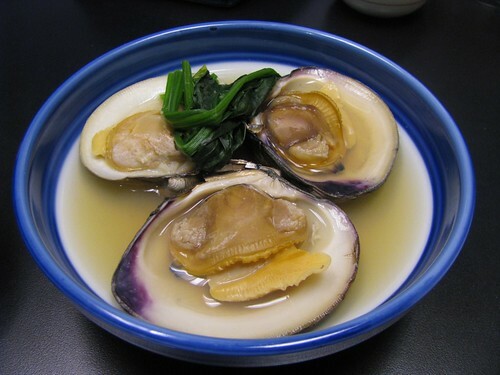 Beautiful in its simplicity, this dish consists of a trio of beautifully plump and surprisingly chewy clams in a lovely broth, and a great garnish of unidentified but flavorful greens. We’ve often remarked on how many of our favorite Japanese dishes can have a somewhat comfort food-y component to them. 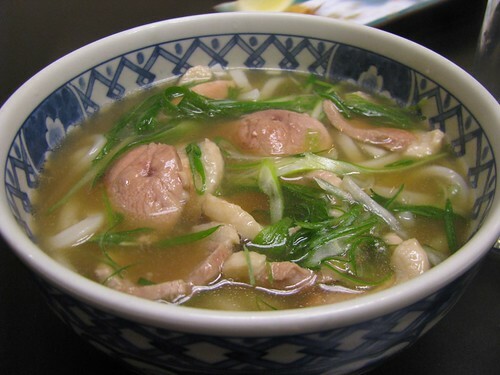 This dish epitomizes the sentiment with plenty of fat udon noodles bathed in a rich, meaty broth, topped off with a generous portion of exceptionally flavorful duck meat and scallions. I don’t believe I’ve ever seen proteins so carefully considered in the context of a soup – perfectly cooked (read – tender) poultry is truly the exception, and is indicative of masterful temperature control in the kitchen. 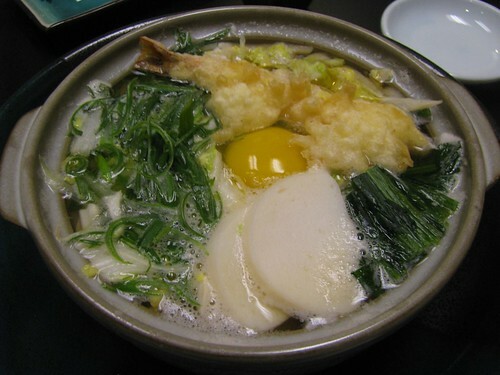 This contained the same udon noodles as in the last dish, but was topped with raw egg yolk, shrimp tempura, fish cakes slices, scallions, and more… and came in a bowl that retained enough heat to keep the broth boiling for at least a couple of minutes after serving. With the egg yolk mixed in, this broth was perhaps even richer than the previous, and among our extended group of 5 it was preferred by all except for one (your humbled author).As meals in a bowl go, you’d be hard pressed to find one more complete (or more satisfying). With that, our meal for two is complete. Total cost: $48.95, green tea included. With one less app, we could’ve done it for $20/person, and we still would’ve left full and, really, just about as happy as if we’d spent 2 or 3 times as much. Needless to say, we highly recommend you to check Kihachi out, and if you go we’d love to hear about your experiences in the comments. This entry was posted in Japanese. Bookmark the permalink. My wife and I did the omekase (chef’s choice) menu a couple of years ago. It was one of the best meals I’ve ever eaten, but it set us back some serious coin. I’ve wanted to return, but I’ve also wanted to pay the mortgage. Thanks for the encouragement! 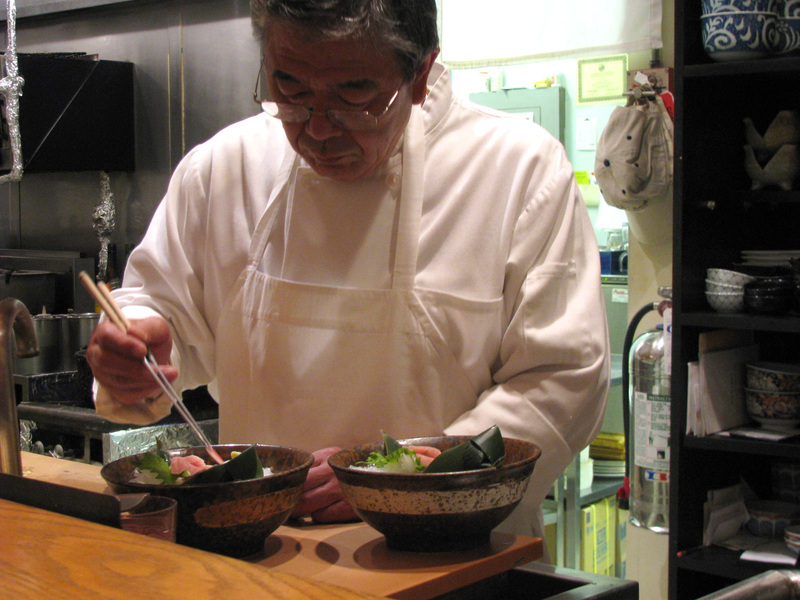 Omakase is an amazing experience there, but, yes… not exactly an everyday proposition! I should note that the number of dishes available for the price target we set was pretty surprising. Probably half of the small plates come in under $7.00, and there are a fair number of dinners in the $15 or less range (and not all of them are noodles!). This is one of the best alt.eats posts ever. In the $50 price range (for 2), I’ve been disappointed lately on a couple outings. But, this looks incredible. Thanks! There are some other great appetizers /small plates in the $6 range. My favorites include the crispy deep fried fresh water shrimp and chawamushi a steamed savory egg custard that is a wonderful comfort food. There are also the fried pork nuggets and one of the pressed sushi dishes was $6.95 during our last visit. Thank you for this post. Cost is the main thing that has kept me away from this restaurant thus far—the tips are greatly appreciated. So happy you posted this. I’ve been waiting to find a “special” reason to go to Kihachi, now it’s on my asap to-do restaurant list. 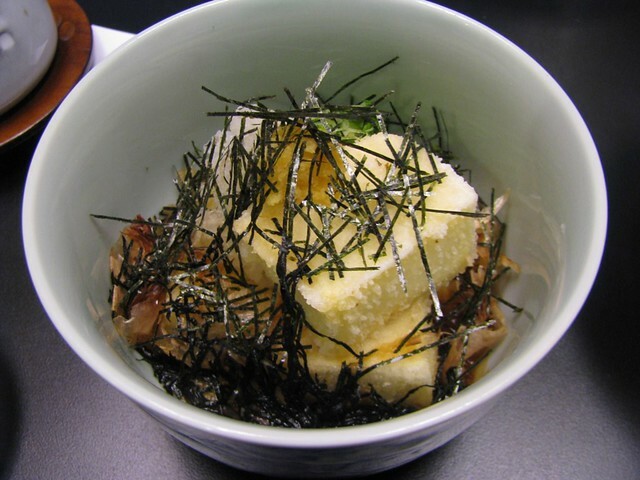 I’ve never seen agedashi tofu that hasn’t been fried, either in my (admittedly short) time in Japan or anywhere online. Interestingly, though, garnishes seem to vary greatly, perhaps based upon region?